The iPhone XR is available in a wide range of bright shades to suit a wider range of styles than the 'let's be honest, it's dull' iPhone XS and most other iModels coming in ordinary, muted colors. At the time of writing there are six colors in all, namely: black, white, blue, yellow, coral and red... you'll agree, a decent amount of choice. These colors have meant Apple isn't bringing out a massive range of cases for the phone (although we're enjoying the Ombre option from Tech21) and most of them are clear. But you should choose carefully, as while the iPhone XR is cheaper than the XS range, it’s still a pricey handset, and you’re likely to be stuck with it for a couple of years at least... so you’ll want a color you’ll love. With that in mind we’ve created this guide to help you choose. 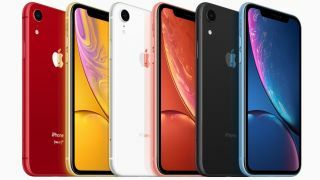 Below you’ll find images of the iPhone XR in every available color, along with additional information on the shades and links to buy them at the best prices we can find – because while all shades cost the same from Apple, prices sometimes vary elsewhere. White is one of the two most ordinary shades that you can get the iPhone XR in - it's an Apple staple. Being plain it’s less likely to turn heads than some of the shades below, but also sure to be less divisive. The aluminum frame also looks the most like metal here, as it’s a silvery white, which isn't too far off the natural color of the metal. Another ordinary shade. The iPhone XR in black, like white, looks less showy than some shades and also looks a bit more like an iPhone XS (as that phone is available in a similar space grey color). Black looks like the smartest option here - something understated. This is more like it if you're looking to stand out. The blue shade is light and bright and unlike the sorts of colors you’d find most iPhone models in. This color makes it immediately obvious that you’re using an iPhone XR as there aren't any other Apple devices using this shade - whether that's a good or bad thing is up to you. If you thought blue was bright, you haven't seen anything yet. The yellow shade is the brightest iPhone XR color and a far cry from the restrained gold color that you can get the iPhone XS in. This shade certainly isn’t for everyone, but if you want an iPhone that visually stands out from the crowd, this is it. The coral shade sits somewhere between red and pink and is perhaps the most unusual of all the iPhone XR colors, just because it’s not a shade you see anything in very often. Like the blue and yellow colors it’s quite bright, and it will definitely attract attention - and possibly shoals of clown fish bobbing past looking for a snack. The red shade, or (PRODUCT) RED to give it its proper name, is so called because a portion of each purchase goes towards (RED) – a global fund dedicated to fighting HIV/AIDS. This shade isn’t quite as bright as you might expect, given the yellow, coral and blue options above, but it’s still a fairly bright red. It's one of our top picks at the moment as it's arguably the most distinctive while still retaining some decorum for the boardroom.